Biscuits. 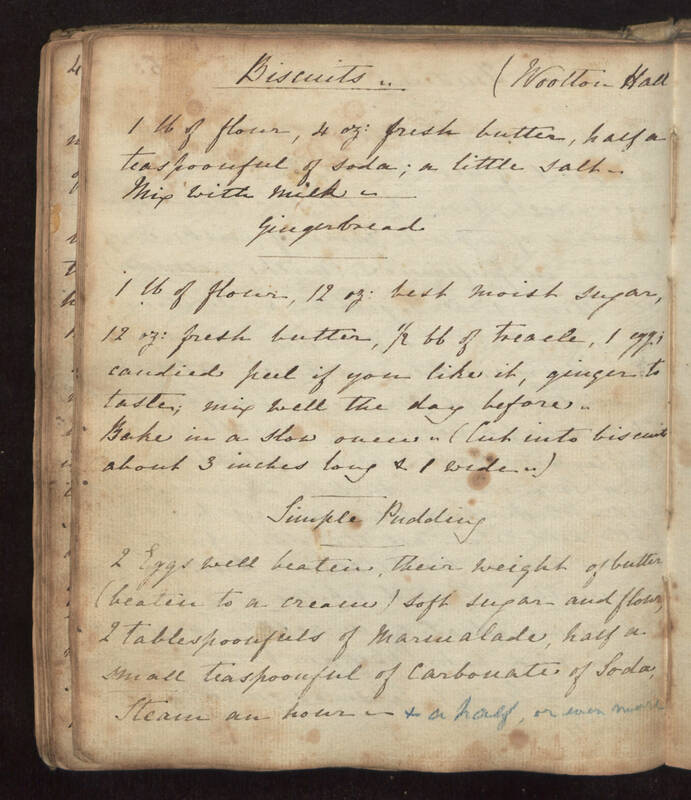 (Woolton Hall 1 lb of flour, 4 oz: fresh butter, half a teaspoonful of Soda; a little Salt. Mix with milk. Gingerbread 1 lb of flour, 12 oz: best moist sugar, 12 oz: fresh butter, 1/2 lb of treacle, 1 egg; candied peel if you like it, ginger to taste; mix well the day before. Bake in a slow oven. (Cut into biscuits about 3 inches long & 1 wide.) Simple Pudding 2 Eggs well beaten, their weight of butter (beaten to a cream) soft sugar and flour, 2 tablespoonfuls of Marmalade, half a small teaspoonful of Carbonate of Soda, Steam an hour - & a half, or even more.